Twenty-six years ago today I lost almost everything I owned in the Valentine's Day Flood of 1986. In November of 1985 my mother died and my step-dad wasn't coping very well in his new role as widower. He asked me if I would move home for awhile. I did and I stored my household in the basement area under his home. Mom and Pop lived in an area of northern California that has been vacation community for years. It floods habitually in winter. The locals expect it and know what to do and where to buy in order to avoid being flooded out. Many homes are built on pillar and post, raising the living area out of harm's way. My parents home was in an area affected by the first rising waters. It was on a hill and they had it raised a story so while the street flooded the house did not. When they had the home raised I went from fearing floods to enjoying them. We were an island of warmth and comfort while the water lapped at the first level of stairs coming to the house from the street. The biggest inconvenience was not being able to park our cars in their normal spot. I was working as a dispatcher for the sheriff's office and normally worked out of the main office in the county seat which was a 20 minute drive away from my town. We worked inside what was essentially a cement bunker and had no idea what the weather was doing. We knew it was storming but had no idea of the intensity of wind and rain. One of the sergeants responsible for the sub-station in my town called the dispatch supervisor and said they needed help answering the phones at the sub. The deputies couldn't answer the phones and do their patrol duties at the same time. Since I lived there and knew which areas flooded first I was sent to report to the sergeant. The normal 20 minute commute took me 90 minutes. The combination of wind and rain was a near lethal weapon. Telephone poles had been sheared at their base or pulled out of the ground. Some lay down and some dangled from the wires at 45% angles, bobbling in the wind. Outside furniture, garbage cans, barbecues and dog houses blew past me like tumbleweeds. Deadly missile tumbleweeds. Areas that normally were not subject to flooding were flooded. I drove a sports car and as much as I loved it, I wished it was a 4X4 so I would have some clearance. I had to pick where I would drive very carefully. My dad had gone away for the weekend which left me to care for the house and the two dogs. I called him and told him I was going to be home to work at the sub and he decided to stay put. It was Monday, February 10. The water came up, the normal places flooded, I answered phones and helped the deputies for long hours. The creeks backed up, the river rose and it was all very normal. I was glad we still had electricity. It was normal to lose power, telephone and cable television when we had storms. I was off duty and at home with the dogs. I had a fire roaring in the fireplace and a book to read. I was as happy as if I had good sense. Then the phone rang. It startled me. "What are you going to do?" My good friend was asking. "About what?" She lives on the same street I did and worked for the same county but in the recorder's office. She had wisely opted not to drive home but to stay in the city. She had the benefit of television news broadcasts and knew there was another storm coming. "They're predicting the river is going to 48 feet." Now I understood the urgency in her voice. The river's flood stage was 28 feet. It had crested at 35 and had receded to about 32 feet. I had no idea that another storm was coming. "I guess I will move my car farther up the hill, not much else I can do." We both hoped that the predictions, which were normally much higher than the actual event, would be wrong. I barely slept that night. In the morning I went to let the dogs out and saw the river was rising again. The rain was coming down like I had never seen it before. I went downstairs and found to my horror that although the river had not come up high enough to flood bottom level of the house, the run off from the hill had found a path of least resistance, travelling under the house in torrents. My furniture and all that I had stored were ruined. My mom had a workshop where she refinished and restored antiques. I began a frantic effort to rescue her final projects. Next came a knock at the door. It was a deputy. I was being remanded into duty. I left the dogs with water and food and hoped if the water got into the house they would be OK, and went with the deputy back to the sub-station. Coordinating rescues with our deputies, fire departments and the national guard, I stayed for days at the office. I literally could not hang up the phone without it ringing again. I wish I had time to relate some of the stories to you. They are heartbreaking and heartwarming. They are examples of human beings at our best and at our worst. The Army Corps of Engineers had made a lake in our county. They said it would take 3 years to fill. It rained so furiously the lake was filled in 3 days. Buildings were unmoored from their pillar and post foundations and taken down river. Cars, propane tanks, natural debris and our filth all made their way to the ocean in record time. I got to get home once and check on the dogs. I had some of the deputies and volunteers I work with ferry me home in the boat they were using for rescues. I promised them warmth and a dry place to sleep. On our way home there was a place the power company had a junction box of cables that hovered above the roadway. We had to lay down flat in the boat to fit under the power lines, which was scary enough, but in the morning as we returned to work I realized I couldn't see the wires. Thankfully when I screamed, "Turn around go back up! I can't see the wires!" there was no hesitation. We had to fight the current while I did my best to guess where the cables were. We had to lift the engine to keep it from touching the live wires and then put it back in the water quickly enough to fight the current again. The angry river was content to slam us against the redwood trees that stood straight ahead of us. 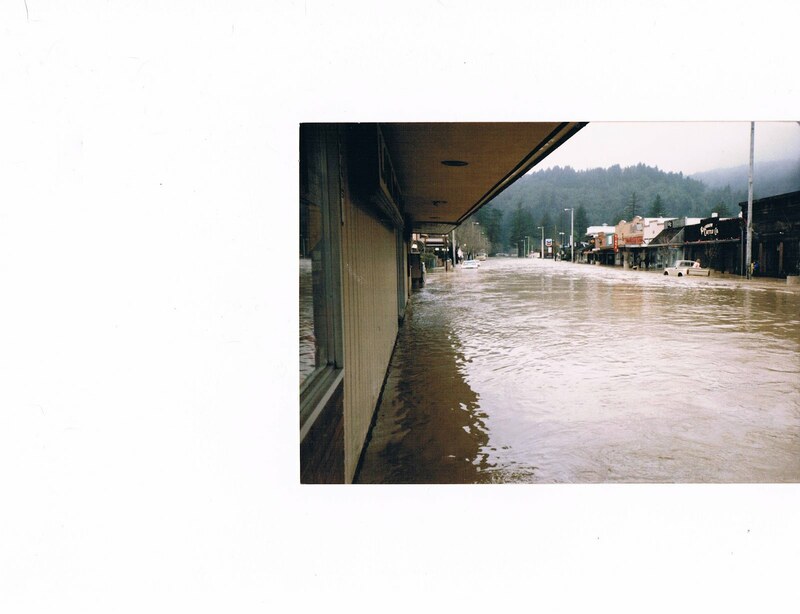 One of the deputies I had harbored during the night drove me home when the waters had receded. He drove right past the house. "That can't be your house, there are only three stairs going up to your house." There were 26 more underwater. The basement had flooded completely. My things were a jumbled smelly mess. All the things I had acquired to that point were gone. Yearbooks, letters, pictures, mementos; all of it gone. The Valentine's Day from hell was over and clean up needed to begin. A final reminder: Enjoy reading the Bible. This won’t always be easy. Your sinful nature will try to make it a chore. It’s not. (Funny, my sin nature never complains about my waisting hours watching TV, but ten minutes in the Bible can raise the firsest objections from my sin!) You have been given a wonderful love-letter from God. Read it, love it, hide it in your heart, and tell everyone else about it! I wish I had thought to compare how much I cherish my mother's letters to me and how I should cherish the Word. Who would have thought that an event 26 years ago would bring a convicting lesson to me today. Funny Valentine's Day present by most accounts but a wonderful gift if you ask me now. Clever God.